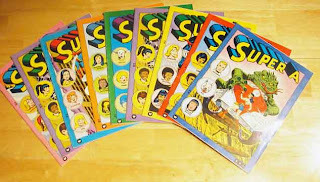 The 1977 SRA Super B comic book set for education. I scored a rare box of educational comic books this weekend. 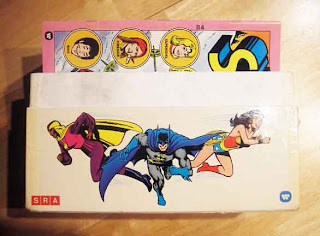 Straight from the 1977 vault, SRA (in cooperation with Warner Bros. who owns DC Comics) put out a set of motivational reading comic books for the classroom. I was 4 years old. 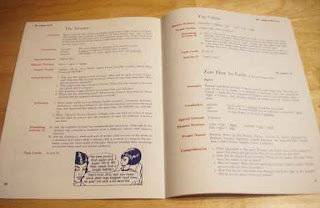 A copy of the different stories. There are six copies of most titles. It includes both Super B and a few Super A stories. The set includes four stories from the Super B set and includes: lesson plans, comprehension questions, vocabulary, phonics, themes attached to life skills and curriculum, task cards, and activity sheets. Apparently there was a Super A pack too, as I have a few of those stories in my box as well. This is an example of the stories. The books are 8.5 x 11 inches. Lest we think we had the idea of using comics in the classroom, there was a push for the movement back in the day, but it didn’t take off. Unfortunately, schools didn’t buy in and it was never released to the public. 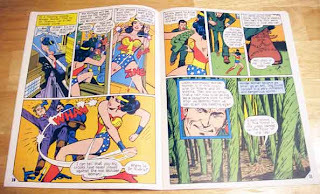 The world was not ready then, but the world has moved on and educators are now accepting, albeit slowly, that comic literature is valuable and educational. 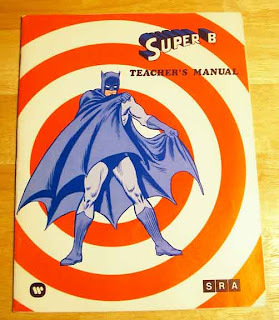 The cover of the teacher's manual. I am putting these bad boys to work. They may be old, but I bet they still have value. I am using this series in my middle school esl classroom with great success. Where can I find the teacher's edition and supplementary materials? Good luck Anonymous. These are long out of print. Ebay maybe?